That’s it: these are amazing fruit bars that are just fruit and fruit alone. I have incorporated them into my daily routine as of this week and I have to say I feel great! These are simply delicious; I have tried all available varieties and I like each one better than the next. The USDA recommends 2-4 fruit servings per day. This 1.2 oz bar gives you two fruit servings that will leave your body satisfied and full of energy to keep on going throughout the day. It easily gets me through my mid-day urge to snack badly. I truly feel full, satisfied and thrilled with myself that I have given my body nourishment and a daily requirement that I usually am simply “too busy” to normally take in. That’s it. fruit bars come in the following yummy varieties: “1 apple + 3 apricots”, “1 apple + 1 pear”, “1 apple + 20 blueberries”, “1 apple + 1/4 coconut”, “1 apple + 10 cherries”, “1 apple + 1 banana”, “1 apple + 1 mango”, “1 apple + 12 strawberries” and “1 apple + 1/4 pineapple”. Each one is gluten-free, non-GMO, between 3-4g of fiber, all natural, Kosher, Vegan and Raw. These are seriously awesome fruit bars! Please check out the awesome blog on their website (http://www.thatsitfruit.com/buzz/) which features recipes and lots food health facts and ideas to help you move toward the healthier you just like me! 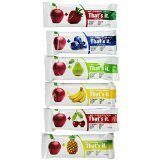 You all need to visit http://www.thatsitfruit.com/ and scoop them up! Previous Article Educational Outdoors Inc. Eating healthy can definitely be tough but these look absolutely delicious! Maybe eating healthy doesn’t have to be difficult.